Do you know any First Aid? It's a simple skill to have, but one that can have such an incredible impact. I think you're never too young (or old) to learn some First Aid and I remember how proud I was to get my First Aid badge at Brownies. I still have my Brownie Guide Handbook and looked up what I needed to do to be awarded my First Aid badge. I had to show how to clean around and put a dressing on a grazed knee and a cut finger, know how to treat burns and scalds (no practical for that part of the badge), show how to stop a nosebleed and on a manikin show that I could perform artificial respiration by the mouth-to-mouth method and know what to do when the patient recovers, as well as demonstrate what I'd call a good bedside manner. Looking back now, it seems quite a lot for a seven to nine year old to master but I'm sure I was keen to do that and more. And to be honest it's something that's stood me in good stead. Thankfully I've not needed to use my mouth-to-mouth resuscitation, or as we call it today CPR - can you tell I grew up in the 1970s? I have though dealt with nosebleeds (not mine) and washed and dressed a few cuts since then. St John Ambulance is the UK's leading first aid charity who want to teach everyone simple, life saving skills. They're right when they say "you can never predict when you might be faced with a life or death situation. But if it comes to it, we want to make sure you have the skills and confidence to be the difference between a life lost and a life saved." And put like that, it's a great incentive to learn some First Aid. 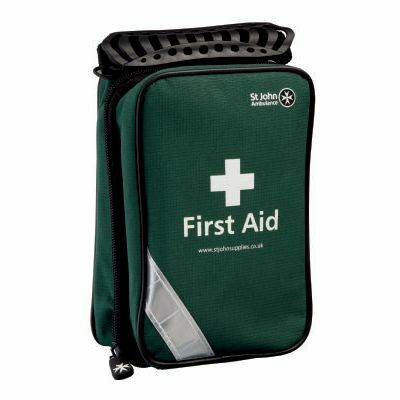 St John Ambulance are offering one reader a Universal Compact First Aid Kit which is great for use in the home or travelling. It's filled with the essentials you'll need for common accidents, and are prepared for any minor emergency. To enter all you need to do is complete the simple rafflecopter form below before it closes at midnight on Saturday 24 October 2015.